Hi all, I thought it was time to let you know of a project I am going to undertake. It all started at the last Clubcento meet at the motorcycle museum in Birmingham, I was chatting with Andre and Rob about a Yellow Sporting Andre has sat in a lockup. which he was going to break for parts. Just out of curiosity I asked Andre if he would let it go as a complete car as I have been after a new project for a while and this cinq sounded like a perfect candidate ! Andre was more than happy for me to take it off him, as the car has a huge amount of history with the club and would be a massive shame to end up broken for parts. I’m currently in the process of arranging for the car to be moved from Andres lockup to my garage, so will take some more snaps of it as is. The plan is to weld up the boot/arches myself, the biggest issue being I’m not a welder, but we have a welder in the family who isn’t aware yet but is going to teach me and help weld up the car… I think it would also make sense to drop the standard engine and pop a 1242 8v in, so plenty of questions will be in order. The bumpers have the odd scuff and crack so they will get fixed / replaced, a standard steering wheel is needed along with a standard gear knob. The seats are in a sorry state but I think a day with an upholstery cleaner would do wonders. Possibly get the wheels refurbished back to new condition. 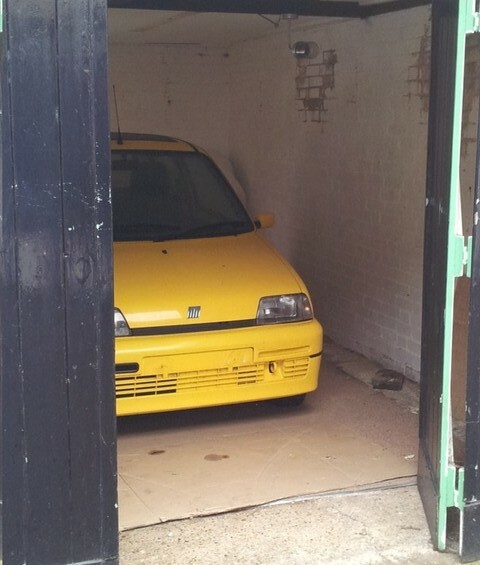 It’s a fair project and wont happen over night, but once finished this will be a great tidy Cinquecento, and will attend some meets and show. Andre tells me this was a show winning car in it’s day !